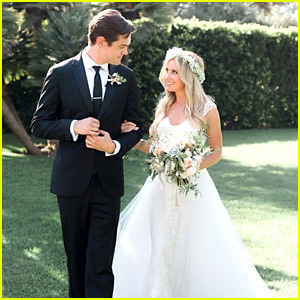 Ashley Tisdale Marries Musician Christopher French - See the Wedding Photo! Ashley Tisdale tied the knot with musician Christopher French on Monday afternoon (September 8) in Los Angeles, her rep confirms to JustJared.com. The 29-year-old actress/producer made the announcement over Instagram: “Best day of my life! Introducing Mr and Mrs French Sept 8, 2014 Shot by @corbingurkin”. Among the wedding guests were of course sister Jennifer and BFF Vanessa Hudgens. Ashley and Christopher got engaged last year on the top of the Empire State Building. Congrats to the happy couple on the exciting news! The ladies were joined at the event, which benefited St. Jude Children’s Research Hospital, by Ashley‘s fiance Christopher French, Happyland‘s Katherine McNamara, and Just Jared‘s own Jared Eng. The tees retail for $45, and are now available for purchase at Velvet‘s branded stores as well as online at Revolve through September or while supplies last. The weekend before, Ashley and Chris were spotted on their way to lunch at Jinky’s Cafe. FYI: Lily is wearing Jennifer Meyer jewelry. Ashley Tisdale and her fiance Christopher French leave a store after doing some shopping on Wednesday afternoon (March 12) in West Hollywood, Calif. The 28-year-old actress is featured in a cover feature for Boohoo‘s latest issue of it’s magazine Stylefix. She chatted with the mag on how she would describe her style in three words. Vanessa Hudgens looks fierce in a floral dress while dropping by her BFF Ashley Tisdale‘s house on Saturday afternoon (January 25) in Toluca Lake, Calif. The 25-year-old actress just returned from premiering her new film, Gimme Shelter, in the Big Apple and met up with Ashley, 28, for a little girl time. “The fact I had to buy a foam roller for my house tells you how sore I am from my workouts this week #killedit #bodyhurts #ubetterwork,” Ashley joked on Twitter about her workout regime. Ashley‘s fiance, Christopher French, is also seen outside their home. FYI: Vanessa is wearing the Kiss Tassle Chelsea Boot by AllSaints. Ashley Tisdale and her fiance Christopher French walk the red carpet together at The Weinstein Company and Netflix’s After Party following the 2014 Golden Globe Awards held at the Beverly Hilton Hotel on Sunday (January 12) in Beverly Hills, Calif. The 28-year-old actress also stopped by the InStyle and Warner Bros. party where she met up with her gal pal Vanessa Hudgens. Nikki Reed was seen looking beautiful in blue at the InStyle party as well! FYI: Ashley is wearing a Yanina dress, Rupert Sanderson shoes, a Lauren Merkin bag, Graziela earrings, and rings by Dana Rebecca Designs and Irit Designs. Nikki is wearing a Monique Lhuillier dress, Stuart Weitzman shoes, a DVF clutch, Sutra earrings, and a Miera T ring. Ashley Tisdale and her fiance Christopher French pick up some holiday gifts from Williams-Sonoma, Pottery Barn, and J. Crew while out shopping on Sunday (December 22) in Los Angeles. The 28-year-old actress recently took to her Twitter account to thank her followers for their support. Listen to “You’re Always Here” in case you missed it!